Without a doubt, food is one of the major perks of living in China. Not only do we get the most authentic Chinese flavors here, but we frequently get them cheap. In addition, a Westerner living in China will inevitably be exposed to all kinds of new and exotic foodstuffs completely unavailable back home. What the Westerner doesn’t expect is to discover those exotic foods produced by familiar American multinational corporations and displayed in Chinese convenience stores. One such example is mint Sprite. Yes, it tastes like mint, and it’s a drink. The Chinese seem to like it, and I read that it’s available in Canada and the UK as well. I bought it once. I finished the bottle, but that was plenty for me. 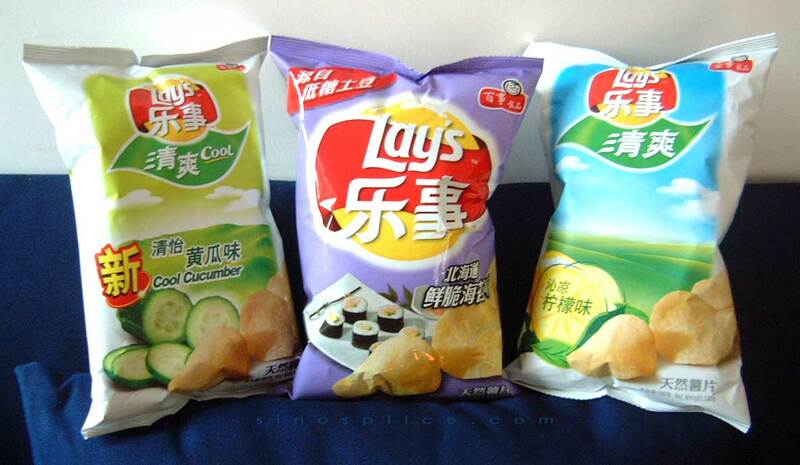 What interests me more is the current Lays Potato Chip Renaissance that we in China live in the midst of. 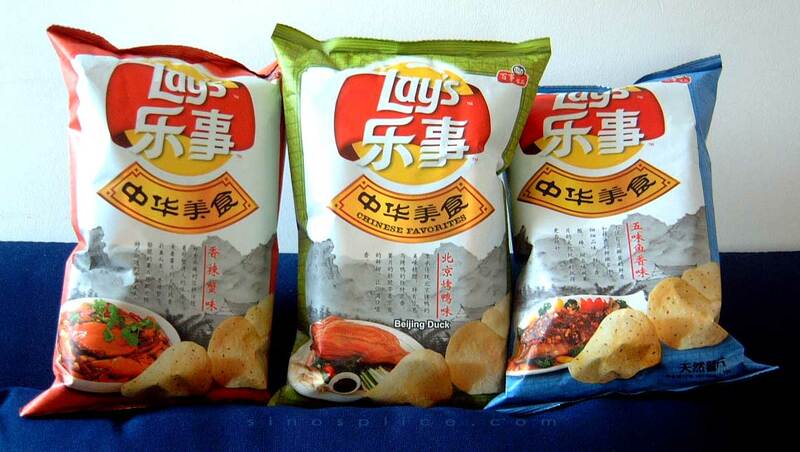 Lays (乐事 — “Happy Things” in Chinese) has come out with some really unusual flavors, and some of them are quite good. Click each thumbnail below for a bigger image. The three flavors in the groups on the left are Cool Cucumber (清怡黄瓜味), Crisp Hokkaido Seaweed (北海道鲜脆海苔), and Fresh Lemon (沁凉柠檬味). I like all those flavors, but the cucumber flavor is especially weird and tasty. The Chinese really know how to appreciate cucumber. Collecting and trying all these strange new potato chips almost makes me think I need to do another Junk Food Review…. * OK, I know my translations of the flavor names are not the greatest, but I also know from experience that translation of Chinese food names is not easy, and in this case particularly not worth the effort. Yeah, China has pretty wild foods, though I still think America has the most variety of cuisines. Of course, if you’re from a hicksville place in Florida, that’s probably not the case. 😉 But if you live in LA or NY, you can pretty much find ANYTHING you want in the world. Well, I take that back–certain meats are probably prohibited in America, the kind that goes woof-woof and meow before meeting their unfortunate end in a sizzling wok. But other than that, you’re good to go. However, I must once again reiterate if I could only eat ONE cuisine for the rest of my life, it’ll definitely be Chinese. And, c’mon, John, of all the marvels of Chinese food, you have to talk about frigging POTATO CHIPS?!!! Tell me this. Can you go to the grocery store in L.A. and pick up cucumber potato chips? Can you??? I ate the bag of Spicy Crab chips this afternoon. Mighty tasty. Heavy on the spice, light on the crab, but still good. Just curious about the translation “Peiking Duck” (which I would have assumed was just a typo, except that you wrote it twice). Surely it should be either Beijing Duck, or Peking Duck no? Oops, you got me. I was writing the “pe” in “Peking” as if it were pinyin. I do stuff like that sometimes. I’ll fix it. I’m backing up Da Xiangchang on this one–walk into any Ranch 99 in California, and yes, I bet you’ll find your cucumber chips and then some. I don’t think you can find these flavors in Ranch 99. These were designed specially for China by the local Lays employees. I remember reading a recent Wall Street Journal article about multinational companies developing new flavors for Chinese, and Lays was mentioned. Even KFC is much better in China. Every Chinese girl I met in the US missed KFC in China. Thanks for the support, Shamu. One of the great conundrums of our time: whether you can find cucumber Lays in California. “Tell me this. Can you go to the grocery store in L.A. and pick up cucumber potato chips? Can you??? Yeah, you may not find Lay’s cucumber chips in the US (yet), but you’ll find plenty of other similar ‘odd’ crap lining the shelves of Ranch 99 and other Asian supermarkets. I bet Whole Foods might have some chips like that,too. This whole business of whether the US has cucumber potato chips ranks right up there with ‘are there WMDs in Iraq’ as one of the pressing issues of the day, IMHO. I’ve actually been rather surprised by the flavours in products since I’ve returned home. Lime seems to have gotten huge all of the sudden: Tostitos with Hint of Lime (not bad), Diet Coke with Lime (haven’t tried it yet) and several others. I haven’t seen that mint Sprint here in Canada, but if you are referring to the blue one I tried it back in Hangzhou and it was, to say the least, f—ing GROSS. Like drinking toothpaste! When I go to the US and decide to go to KFC, I miss KFC in China, much better here than there. the cucumber potato chips are nasty too, the chinese have gone to crzy with their artificle flavorings, only cucumbers are supposed to taste like cucumbers. John, I have to disagree about the variety of processed foods. True, each product may have quite a few flavors to offer here in the US, but in China there are so many more products, when it comes to snacks. Every Chinese I know of bring snacks in the US when they come back from China. I’ve never tried mint Sprite, but I can imagine the taste. I guess to westerners, it’s like root bear to us Chinese. Yuck! Sorry, the last post should be addressed to Patrick. Cucumber chips sound delicious if it’s anything like actual cucumber dip – tangy, just like cold garlic cucumber as an appetizer before dinner. Lay’s are incredibly addicting in China as are the PRINGLES and Lay’s interpretation. There are WHOLE rows devoted to chips in the local grocery stores – Americans love to eat that stuff so I tend to avoid chips if possible. Instead, I like mixed nuts, almonds, pistachios (a healthy habit I learned from Chris Wah Lee), dried fruit like mango strips and pineapple rings. China’s KFC is awesome only because of the 2RMB ice cream softserve and Mexican Chicken wraps which is a super-tasty texture and taste on the “burrito”. Today, in San Francisco, Wayne and I ate at McDonald’s out of convenience before meeting friends at SFMOMA. It was french fries and Filet o Fish. And you know what? Junk food it was, but it was quick, fast food. John, so will the chinese have pork rinds or carmel corn when i get there or should i bring some along for others to sample? WilsonTai: alf is more spot on about the cucumber chips–they’re not crisp and cool like a fresh cucumber, but more like one that’s a bit old and has been sitting out overnight. The lemon is better, but I still prefer Cumin or Seaweed Pringles. John, all of the “Chinese Favorites” in my local store here in Beijing have English labels, not only the Peking Duck. And I really can’t see how Mint Sprite is going to succeed once the novelty has worn off, judging from the reception to my offers of Altoids (“tastes like Chinese medicine!”). so look around, Lays has all types of chips. I recently moved to Beijing and tried the Lays varieties you mention in your article and LOVE them!!! I tried to go to the Lay’s website to suggest that they more widely distribute them in the US, especially where there is a large Asian population. Unfortuantely, their website was not friendly to suggestions. Hopefully, a distributor will read this thread and get the message. AND I agree the food here is amazing and cheap! Too bad some prefer to complain about the differences vs. enjoying them. actually i hate this kind of junk food , i donot think it is good for my throat when i wanna buy it ,but sometimes i have to, only for my girlfriend. John I haven’t had O’Zack’s, before but “a Japanese brand, which produces such mouth-watering flavors as “Kimchi and mayonnaise”…. I’ve tasted the lemon and the cucmber chips when I was in China and they’re great! Hopefully, they’ll get them in North America!….SOON.